Server Station � On-site, running the simulation and feeding simulation data to the satellite stations via the network. This can be the plant network or a local loop network. The simulation exercise can be controlled from the Server Station. Instructor Station � An On-site full control station and it can be located anywhere on the network. It can be a notebook computer that the instructor takes around to manage the exercise while checking on the different stations. 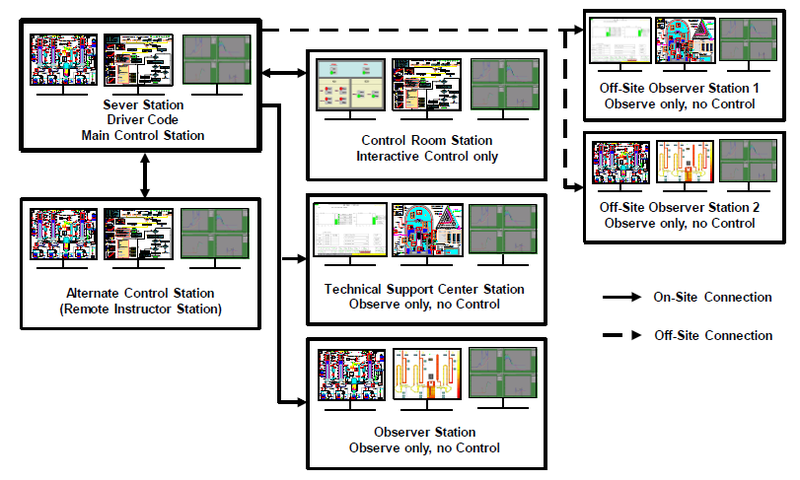 Control Room Station � An On-site interactive station where only manual actions can be executed via the screens. Technical Support Team Station � On-site. This is a passive station. One or more Off-Site Observer Stations � These stations link off-site support teams, such as the regulatory authority, a severe accident team or the plant designer into the exercise drill just as they would be in an actual incident. Each Station can have a single monitor or multi-monitor display. The instructor controls the information seen on the satellite stations. Each satellite station can have its own screens and plots to display the information that is appropriate for that team in the relevant form. For example the Control Room Station can display information available in the control room on screens representing the control room panels. The Technical Support Team Station can display information in screens of the Safety Parameter Display System (SPDS). For training each station also can display the typical SIM/TVP visualization screens, but these screens would be blocked during an exercise. The SIM/TVP Multi-Station Training Setup is installed at the Borssele Nuclear Power Station (a PWR). Copyright © 2009 Risk Management Associates, Inc. All rights reserved.